So close yet so far. German veteran Philipp Kohlschreiber came extremely close to pulling off a second upset win over Novak Djokovic in as many months. But, it was not to be as Djokovic proved to be too resilient an opponent in the end. There are a lot of takeaways for Kohlschreiber from the match, nonetheless. He played exceptional tennis, ripping some outrageous forehands for the most part. More on that later though. Djokovic, as he so often does, stood his ground in the midst of a flurry of attacks and eventually took the match with a solitary break of serve in the deciding set which he secured early. A highly competitive encounter, this match saw ups and downs for both players. 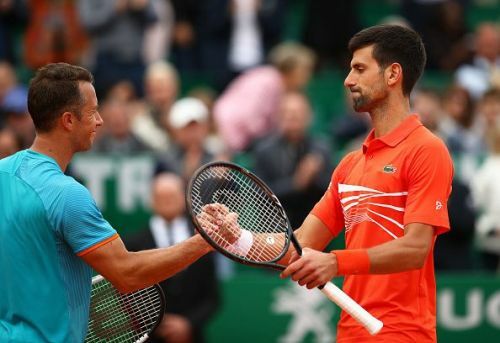 Kohlschreiber looked like he had stepped out with the mindset of trying to control the exchanges, and he did do that - at least as well as one can against an opponent of Djokovic's stature. Going back to the forehand; that shot from Kohlschreiber had never looked this threatening in his entire career. The cross-court winner at 2-3 30-all in the second set is one for the highlights reel. Another piece of magic to sit back and marvel at came at deuce in the second game of the decider. Kohlschreiber used his weapons smartly and the fact that he held well on serve - except in the bizarre second set - against one of the best returners of all-time speaks volumes. He also generated a total of 16 break point opportunities in the match, converting on 4 occasions. He took the match to Djokovic and that was the only way in which he was going to win. Nothing was off-limits for Kohlschreiber in the match. Serve and volley on the red clay? Well, he gave that a shot too. The German came close to gaining the upper hand on numerous occasions in the match, but came up just short in the end. Djokovic, on the other hand, did not pull out anything too extraordinary from his bag of tricks; he was not really allowed to at times. Yet, he simply kept going from strength to strength and therein lies the quality of a champion - finding a way to win even in the most difficult of situations. However, it's Kohlschreiber's transformation that truly warrants attention. He has added even more flair to his game and that is after having been on the tour for almost two decades. Clay is his favourite surface, and this might be the time of the year for him to spring a few more surprises.